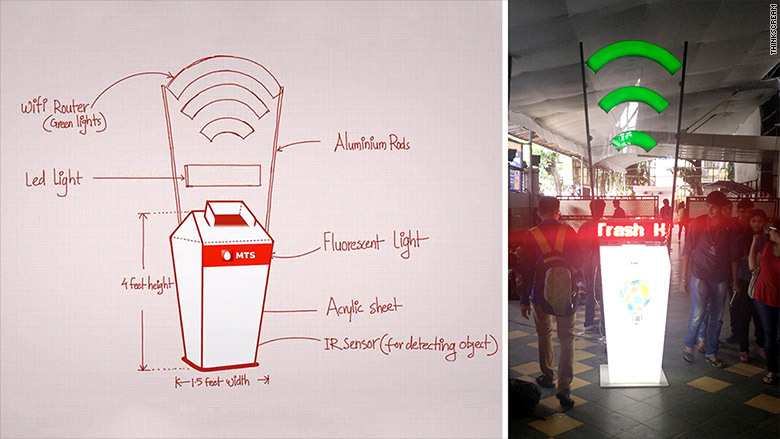 ThinkScream's smart trash can rewards users with 15 minutes of free Wi-Fi for throwing things away. Trash belongs in the garbage bin. It's a simple civic lesson that has frustrated two Mumbai entrepreneurs for years. "India is a country where people love to break the rules," said Raj Desai, cofounder of startup ThinkScream. "We see it on the roads where no one is driving in their lane. We see it in the way people disrespect public spaces by throwing garbage anywhere that they want to." So Desai and cofounder Pratik Agarwal had an idea: Reward people for throwing things away. The idea for the smart garbage can came about at a popular Bangalore music festival in 2013. "Pratik and I got lost and it took us two hours to find each other," said Desai. "It struck us that we needed to come up with a solution for people to stay connected at these events." They were also struck by the massive amounts of trash everywhere. So Desai and Agarwal, both 26, invented a trash can that rewards people with 15 minutes of free Wi-Fi every time they throw something away. The smart trash bin from ThinkScream. The plastic bin (which costs about $1,470) is four-and-a-half feet high with an LED screen. When you throw something in it, the screen flashes a unique code to access 15 minutes of Wi-Fi (which works within a 50 meter radius). ThinkScream partnered with a local telecom company and debuted six smart bins at a music festival in 2014. Since then, the startup has received a number of inquiries from companies who see it as a viral branding opportunity, Desai said. "But that wasn't our intention," he said. "It wasn't a gimmick. It was meant to be a catalyst for the public to change their behavior and stop littering." Using technology to change behavior is what Desai and Agarwal set out to accomplish when they launched their startup in 2012. ThinkScream comes up with innovative ways to provide Wi-Fi to Indian consumers. Its flagship product, customized for movie theaters in Mumbai, allowed people to use Wi-Fi to order food from the concession stand and and have it delivered to their seats. They rolled it out into 60 theaters in Mumbai. 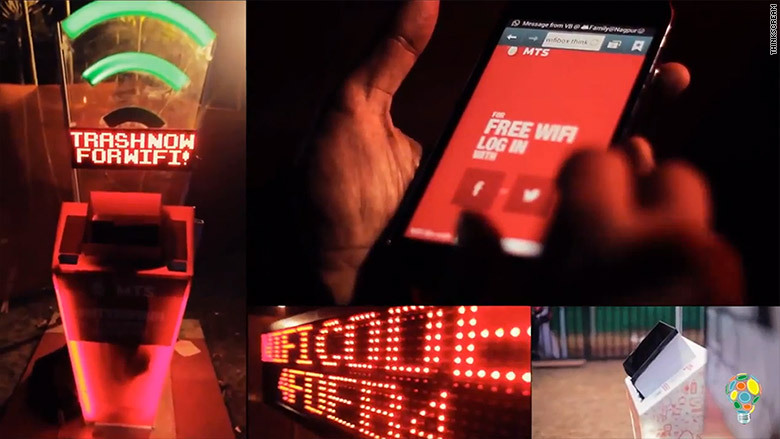 ThinkScream has also partnered with music festival organizers to provide attendees with easy Wi-Fi access. How successful are the bins? It's too early to tell, said Desai. "We haven't done a before-and-after analysis yet, but anecdotally we know that people do like to use the bin for the wow factor at first and then for the free WiFi," he said. ThinkScream doesn't have any smart bins currently deployed (although there are a few test bins at events and colleges). But Desai is encouraged that private companies and government agencies have reached out to see how the bins can be deployed in large cities like Mumbai. Mumbai, Desai's hometown, is India's most populous city with more than 18 million residents. It is also the world's fifth top producer of solid waste, according to a May 2015 report by the Proceedings of the National Academy of Sciences. The city generates over 7,000 tonnes of solid waste daily, according to India's Central Pollution Board Control agency. And a lot of that waste isn't properly contained in trash bins. "It's unhealthy and can lead to diseases," said Desai. The free Wi-Fi could entice people in urban settings where more residents have access to mobile devices. But what about rural areas? Desai said he's already thought about how to tweak the bin's design. "Instead of free Wi-Fi, we'll use an interactive image of a celebrity," he said. One example: Indian cricketer Sachin Tendulkar. "The LED screen could show a photo of Tendulkar frowning. But he'll smile if you throw trash in the bin," said Desai. Desai wants to soon have his smart trash cans around India -- everything from movie theaters and malls to public spaces and rural communities. "This is just one way to help change the mindset of people in India," said Desai. "We just hope that bureaucracy doesn't slow us down."